The Governing Board of the Official World Golf Ranking (OWGR) has approved the inclusion of the All Thailand Golf Tour, the Professional Golf Tour of India (PGTI) and the Japan Golf Tour’s Abema TV Tour, into the OWGR System. 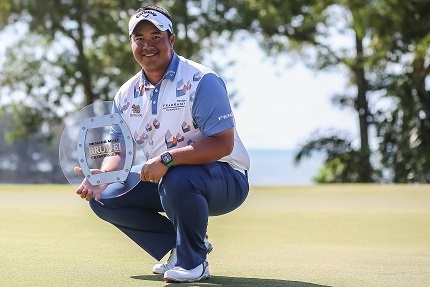 Kiradech Aphibarnrat is a graduate of the All Thailand Golf Tour. The All Thailand Golf Tour and Professional Golf Tour of India will be introduced to the OWGR at a minimum level of five first place points for their tournaments that are played over 72 holes. The Abema TV Tour will be introduced to the OWGR at minimum points levels of four first place points for its tournaments that are played over 54 holes. Inclusion for all three Tours is effective for OWGR Week 1 – week ending January 6, 2019. The Governing Board also announced that the Asian Tour’s Ho Tram Players Championship is to acquire OWGR Flagship Tournament status in place of the Indonesian Masters, effective immediately. The winner will receive a minimum of 20 first place points. The elevation of the All Thailand Golf Tour and Professional Golf Tour of India is an acknowledgement of the continuing role they play in developing players. Testament to the strength of the fields at their respective tournaments is the fact that recent years have seen the likes of Thais Kiradech Aphibarnrat, Jazz Janewattananond and Poom Saksansin, and Indians Shubhankar Sharma, Anirban Lahiri and Gaganjeet Bhullar graduate from their domestic circuits. Uttam Singh Mundy, CEO of the PGTI, said: “The inclusion of PGTI in the OWGR system is a game-changer for Indian golf. We see it as the international golfing fraternity’s recognition of PGTI’s sustained growth since its inception 12 years ago and its emergence as the premier tour of the South Asian region. “The several accomplishments of our professionals on the global stage have been a key factor in raising India’s stature to a major power centre of Asian golf that has in turn drawn the attention of international bodies such as the OWGR. “The PGTI, under the leadership of its President, Gautam Thapar, had made focused efforts towards aligning itself with the OWGR system over the last few years which included the all-important decision of making the PGTI an ‘Open Tour’ from the 2018 season onward. Our persistence towards the cause has borne fruit as the decision to transform into an ‘Open Tour’ has paved the way for approval of world ranking points for the Tour. Official Tournaments from the leading professional Eligible Golf Tours from around the world as well as Major Championships, World Golf Championships, Olympic Games and the World Cup of Golf (Individual competition only) are eligible for World Ranking Points (excluding team events). Any player competing in any of these tournaments will receive World Ranking Points subject to their respective finishing position which are awarded according to a tournaments strength of field and the players finishing position. The Eligible Golf Tours which are currently included in the OWGR System are: Alps Tour Golf, Asian Development Tour, Asian Tour, Big Easy Tour, China Tour, EuroPro Tour, European Challenge Tour, Japan Golf Tour, KPGA Korean Tour, MENA Golf Tour, Nordic Golf League, PGA European Tour, PGA Tour, PGA Tour Canada, PGA Tour China Series, PGA Tour Latinoamérica, PGA Tour of Australasia, ProGolf Tour, Sunshine Tour and Web.com Tour.